Tier One Manufacturing - What?! Solar ‘lingo’ can sometimes make installing or talking about solar power just too hard – BUT it doesn’t have to be so difficult. One term that is thrown around a fair bit is ‘tier 1,’ ‘tier 2’ and ‘tier 3’ manufactured. So here is the simple and easy explanation to help you understand in just a few minutes. Does the manufacturing company invest money into research and development in order to try and better themselves or their process? How much of their manufacturing process is robotic and how much relies on human production lines that are open to variations in quality and human error? How long have they been manufacturing solar panels? Using these four questions, solar panel manufacturers are rated as tier 1, 2 or 3. The following diagram shows what answers will get a manufacturing company into their respective tiers. Tier 1 solar panels – Manufacturers who qualify as ‘tier 1’ definitely set themselves ahead of the rest. They are in complete control over each and every piece that goes into making their solar panel – they can guarantee the quality of each component used. They are heavily automated and always looking for way to better themselves in terms of quality, price, techniques and so on. They have also been doing this for over 5 years. 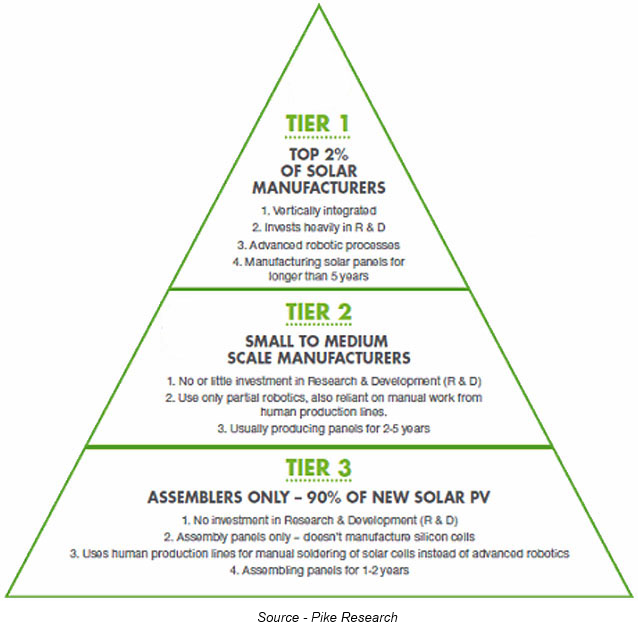 This represents roughly 2% of the manufacturing market today so it is no easy feat to be classified as ‘tier 1.’ Tier 1 solar panels are often the best performing panels on the market. Tier 2 solar panels – These are panels that use a little bit more manual labour in the manufacturing process. They put little or no money into research and development and have been operating for between 2 and 5 years. They represent about 8% of the manufacturing market today. Generally they produce a mid range performing panel at a mid range price. Tier 3 solar panels – These are companies that purely assemble solar panels for sale. They do not manufacture any of the components themselves or put any money in research and development. They have only been in operation for 1 to 2 years (and will in all likelihood not be around for many years to come!) This represents around 90% of the manufacturing market today. They produce a poorly performing solar panel at cheap prices. When comparing solar panels, price is not always the best indicator. There are many ways of grading solar panels but it is most important to compare prices of like products – if given two quotes make sure you are comparing good quality components (such as tier 1 manufactured so panels) with other good quality components. Compare apples with apples and grapes with grapes.